Nutmeg-orange IRON phantoms and inclusions - we haven't seen another - set this Arkansas crystal plate cluster into another realm. It has a powerful grounding/soaring energy not quite like any we've worked with and will be especially good for balancing your life, determining priorities and so forth! Large cabinet size: 3-5/8x 4-1/2x 1-3/4" high to sit or stand up. Two crystals have uncommon 7h faces, one's a rare 8-faced. Raised record keepers, rainbows, two interesting fully regrown faces, three at the back which have not. 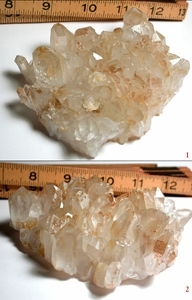 The largest crystal is 5/8x 1-3/4" high severally penetrated and with a large bright foil. There's even a flying tabular doubly-terminated crystal with a bit of creamy yellow drusy. From the golden healer mine at Collier Creek.